This letter was written by Pvt. Christian Shirley (1835-1915) of Co. K, 12th Virginia Cavalry. He entered the service in August 1862 at New Market, [West] Virginia. and was taken prisoner on 3 May 1863 at Buckhannan, Upshur County, [West] Virginia by the 151 New York Infantry. Shirley was sent initially to Athenium Prison in Wheeling, Virginia, then to Camp Case in Columbus, Ohio, on or about 26 May 1863. He was transferred to Johnson’s Island, Ohio, on or about 14 June 1863, and remained there until 30 October 1863 when he was sent to Lookout Point, Maryland. He was imprisoned there until 14 February 1865 when he was finally exchanged after 21 months captivity. When taken prisoner, Shirley’s description was recorded. He was described as a 27 year-old farmer from the Shenandoah Valley who stood 5 feet 11 inches tall, had a fair complexion, black hair and grey eyes. Shirley wrote the letter while a Confederate prisoner at Johnson’s Island Prison — an island in Sandusky Bay in Lake Erie. 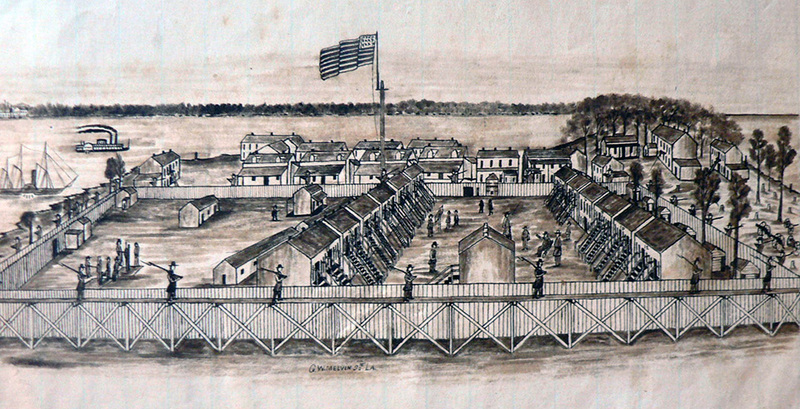 Most of the prisoners held at Johnson’s Island were officers but it held enlisted men as well. The prison held more than 10,000 confederates during its three years of operation. Shirley was from New Market, Virginia. (The Shirley House Property was purchased in 2001 by VMI Virginia Military Institute and made part of the New Market Battlefield State Historical Park). Shirley wrote the letter to his friend, Jacob Petefish (1822-1902) who married Nancy C. Strickler (1832-1918) in New Market, Shenandoah Co., Virginia, in May 1855. Jacob and his family was enumerated in Virginia, Cass County, Illinois in the 1860 U.S. Census. I seat myself this evening to drop you a few lines to let you know that I have made another trip to the Western country, though I do not enjoy this one as well as the first. I am a prisoner of war and have been here for 4 months. I would have written sooner but I do not know your post office and writing material is scarce with me. That, [and] I thought it doubtful if you would get it were I to write. I will send this to Illinois and I hope to the place where you will get it. I am in the enjoyment of good health and hope that these few lines may find you and your family enjoying the same great blessing. I received a letter from home on the sixth of this month. They were all well. I suppose that Frank Strickler gave you the news last spring, as he has also been traveling out this way though he did not tarry so long as I. The people were all well last spring when I left the [Shenandoah] Valley. I have nothing of interest to write. If you get this, please answer soon for this is a very tiresome place and a letter from a friend revives my spirits and recalls happy recollections of the past.